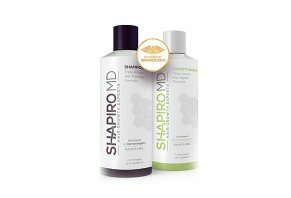 Shapiro MD Hair Growth Experts Reviews - Is it a Scam or Legit? Developed by dermatologists, Shapiro MD is a hair loss treatment system that uses a 3-In-1 topical treatment shampoo and conditioner to help those experiencing male and female pattern baldness achieve thicker, fuller hair in just 30 days. How? Using only natural, pharmaceutical-grade ingredients, the proven system promises to block the hormone DHT from causing hair loss, while also using stem cells to rejuvenate follicles and stimulate hair growth. Based on more than 10 years of scientific research, the website claims most patients see results after just a few days of regular use with Shapiro MD, although major improvements—such as thicker, fuller hair and improved texture—have been reported within weeks (usually 30+ days). Just use a nickel to quarter size amount every time you shower, and the company claims their triple action formula will work best for retaining existing hair and promoting new growth in the crown and temple area. Which is why they tell us it has helped thousands of men and women over the years. Look, there’s no question that losing your hair stinks. But is the Shapiro MD system really the most reliable way to stop hair loss and regain thicker hair? Is its patented formula based on verifiable breakthrough scientific research? Is it about to take the hair loss industry by storm, as mentioned in their long-form sales video? The company makes a lot of big claims on the Shapiro MD website. Here, based on what we learned during our research, we’ll help you better understand their legitimacy. What Causes Hair Loss & What Role Does DHT Play? There can be a variety of causes of thinning hair, including poor nutrition, infection, some medications, trauma, and poor grooming habits. However, affecting nearly 40 million of the 55 million American men and women experiencing hair loss is something called male and female pattern baldness. Without getting too technical, this involves an enzyme called type II 5-alpha-reductase that converts testosterone into dihydrotestosterone (DHT). When this DHT attaches to a hair follicle, it ‘instructs’ the hair to grow in continuously thinner cycles, until the follicle eventually becomes dormant and ceases producing hair altogether. While there’s no cure for this DHT-induced hair loss, the are popular over-the-counter medications like 2%-5% minoxidil creams and shampoos. However, this ingredient might not be as effective for individuals who have been experiencing hair loss for five or more years, and it’s primarily used to stop hair loss, versus re-grow hair. There are also prescription medications like finasteride, although it’s only for men and requires that you continue using it to experience benefits. What About Shapiro MD’s shampoo and conditioner? What ingredients does it promote—and will they deliver? Which Ingredients Are Found In the Shapiro MD Hair Loss System? Is there clinical evidence showing these ingredients are effective for addressing hair loss? Or, for specifically blocking DHT? According to sites like these, as well as Examine.com, this seems to be much of the same situation when it comes to caffeine and green tea as well. Are There Any Potential Side Effects Related to Shapiro MD? Again, according to authoritative sites like WebMD and Examine.com (after all, we’re not medical professionals), the topical application of these four ingredients likely won’t cause any side effects. And if they do, they probably won’t be worse than mild irritation. Shapiro MD expressly notes that their hair loss shampoo and conditioner are only intended for men who are 18 years old and above, as well as post-menopausal women. Finally, the website indicates the system won’t interfere with hair coloring, and it may be used together with Rogaine. What’ll you pay for Shapiro MD’s ingredients? How Much Does Shapiro MD Cost? If you choose the single system, you’ll pay $7.95 S&H, while all other options including free rush shipping. Regardless of the amount you purchase, Shapiro MD products come with a 60-day refund policy, less S&H. According to the company’s Terms, this begins on the day your Product is shipped from their fulfillment center. Need to request a refund? Customer service can be reached at (877) 907-4047 or support@shapiromd.com. While extraordinarily common among consumer products and services, it’s important to note that all Shapiro MD purchases are subject to an arbitration agreement. This basically stipulates that instead of settling a disagreement in court, this would occur via third-party binding arbitration. What Do We Know About Steven Shapiro & Michael Borenstein? Shapiro MD was co-founded in January 2011 by Steven D. Shapiro M.D., Ph.D., and Michael T. Borenstein M.D. Before starting the company, Dr. Shapiro’s bio indicates that he earned his medical degree from UMDNJ New Jersey Medical School and performed his residency in Dermatology at the University of Miami School of Medicine. Currently, Dr. Shapiro provides his services at Gardens Dermatology & Cosmetic Surgery Center in Palm Beach Gardens, FL. Dr. Borenstein is also a board-certified dermatologist on staff at Gardens Dermatology & Cosmetic Surgery Center, who completed his internship in Internal Medicine and residency in Dermatology and Cutaneous Surgery at the University of Miami School of Medicine. Currently, his bio indicates he’s a specialist in medical, surgical, and cosmetic dermatology. Despite their experience in medicine and the fact that the company’s been in business since 2011, we didn’t encounter any customer feedback for their hair loss shampoo or conditioner at the time of our research. Neither they nor their parent company, Immudyne PR, were listed with the Better Business Bureau as of 5/13/17. However, we did locate the 4,068,636, 8,985,124, and 9,532,941 patents listed on their website. We discussed the first two earlier, but interestingly, 4,068,636 is for a thermostatic device for automatic choke control granted in 1978, so we’re not quite sure how it relates. Now, let’s find out how this hair-loss system relates to other OTC hair loss shampoos and conditioners. Is Shapiro MD Better Than the Competition? Did we encounter any formulations exactly like Shapiro MD’s shampoo and conditioner-based system? No. However, you only need to type the phrase “caffeine shampoo” into your nearest search engine to see that there are dozens of formulations that contain at least this stimulant (along with others like argan oil, niacin, and biotin). During our research, we found most of these priced in the $10-$15 range, although many could be found for $8 or less. On top of this, some brands were sold through national big box stores, potentially getting it in your hands faster, saving on S&H, and making the return process as easy as hopping in your car if you end up dissatisfied. Expanding your search to “hair loss shampoo and conditioner” will reveal dozens more options, many of which contain the minoxidil mentioned above. And based on what we learned from authoritative sites about the level of clinical evidence supporting its ingredients—along with the fact that these competitors could be found for about half the price—it’s easy to imagine they might provide more bang-for-your-buck than Shapiro MD’s system. Let’s carry this thought over to the final section as we wrap up. Here at HighYa, we’re not necessarily focused on price, but on the overall value provided by a product. But at twice the price as much of the competition—and using a formulation that’s reported by authoritative sites to have minimal clinical support for its efficacy at addressing hair loss—it might be difficult to recommend Shapiro MD as a first choice. Furthermore, even if they did have robust clinical support, the company tells us this shampoo and conditioner team is only effective for addressing hair loss around the crown and temple area. So, if your hair loss is occurring in between these regions, it might not be the first choice, either. Bottom line? If you’re worried about hair loss, be sure to read through How to Choose a Hair Loss Product. Then, make an appointment with your doctor about whether or not any of these options are viable based on your specific diagnosis. If you feel like rolling the dice on Shapiro MD, though, the company seems to stand behind the system with a 60-day refund policy. Just keep in mind you'll lose your original shipping charges (if you ordered the single option), plus whatever it will cost you to send the bottles back to the company. Helps make your hair thicker and starts to grow new hair. The shampoo and conditioner smell awesome too. I have been using this product for months and am going to keep using it. I would recommend this shampoo and conditioner for anyone who has think hair or needs spots to grow. This is the most predatory company I have ever met. Their product doesn’t work and they constantly play games with their billing vs. the price advertised online. I just tried to buy a 4-month supply at $133.87 and they charged me $199.80. I had to call them and cancel the entire order. DO NOT work with these people - it's a money-driven marketing scam. I have been pleasantly surprised by your products. I have been using your shampoo and conditioner for about 6 weeks and have seen a vast improvement in my hair, it looks thicker and more healthier than before using your products. I would recommend this to my friends, in fact, have already recommended it to several people. I love this product. So far it is the only product that helps to stop the hair shedding. After a few months, the hair starts looking fuller. It is easy to apply, only need to keep it on for 2-5 minutes. Good product, I use frequently. I recommend for anyone interested in their hair. Customer service is excellent. Reply and answers by email or phone are responsive. The shampoo and conditioning is an awesome base combination to initialize hair and scalp treatment. Thank you! I saw new growth of hair after using Shapiro shampoo and conditioner for only 30 days. I love this product and have tried several others, but none have been as effective as Shapiro. Thanks. I'm a bald man, I think my hair started falling out at age 18. Which was devastating. I saw Shapiro MD and thought I would give it a try. We went to France to see my wife's sick cousin. So I waited to try it, I've used it for more than two months. And nothing. Maybe it's because I have a tight scalp. Either way I was hoping it would work. But it hasn't worked at all. So I'm labeling it a scam. I am a 63-year-old woman who has lost a good 60% of her hair. I have tried Biotin products, Nioxin products, and Tea Tree Oil products. None of these made a difference. I am ecstatic to have found the Dr. Shapiro products. The shampoo makes my hair so thick and shiny, and the conditioner removes all of the tangles I was experiencing. My hair is so thick and full now. I couldn't be happier! I am delighted with the results of Shapiro MD Shampoo and Conditioner! My hair has never felt thicker with body and shine! I could see results in as little as two weeks of using Shapiro MD Shampoo and Condition...wow! I highly recommend this product for anyone that wants to improve the health of their hair. Even my friends have commented on how my hair looks thicker! Stop ordering other products and try Shapiro MD Shampoo and Conditioner, you will be delighted with the results as well. Definitely 5 stars! I am really liking this product! It makes my hair feel CLEAN, SOFT, AND NOT OILY like some of the others. It makes my hair feel fuller too. One person asked me if I "added" hair and I told him I was using the MD Shapiro Shampoo and Conditioner. Will be getting more before I run out. I'll admit I was somewhat skeptical when ordering the product, but I did. I have been using the shampoo and conditioner for one month now and I was pleasantly surprised to see the new growth on my bald spot on the crown of my head. I am looking forward to seeing the continued hair growth after the next 3-4 months. I love the fragrance of both the shampoo and conditioner. I will continue to use and recommend this product. Write a Review for Shapiro MD!